When Buddy the elf (Will Ferrell) discovers that he has been adopted, he embarks upon a journey from the North Pole to New York to meet his real father, Walter (James Caan), and spread some much needed Christmas spirit. Elf is one of my favourite Christmas movies. Jon Favreau’s 2003 Christmas classic never fails to make me laugh - largely thanks to Will Ferrell’s hilarious and endearing performance. I need to watch Elf at least once every year and, if I’m being honest, often more than once. This year, however, I decided to try something different. Instead of dusting down ye olde DVD, I booked tickets to watch Elf at London’s Backyard Cinema. Four years ago, Dominic Davies decided to build a cinema in his back garden. He wanted to share his passion for film and community cinema and, thus, Backyard Cinema was born. 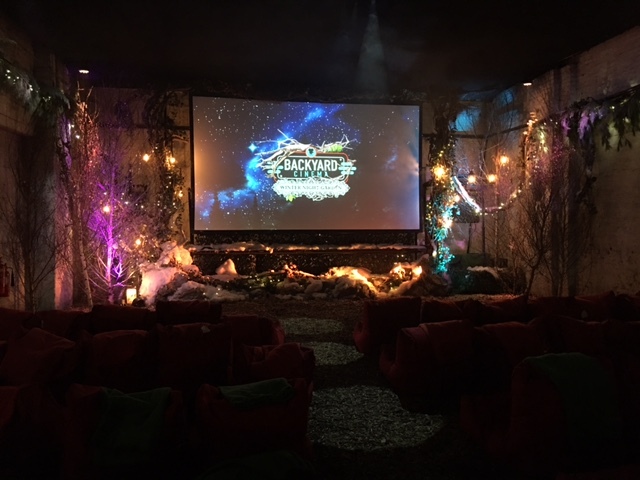 Fast-forward until today and Backyard Cinema has moved out of Davies' garden and now boasts an impressive schedule of special film events at a range of exciting locations. Past venues have included outdoor markets and a beautiful church (for a special screening of Baz Luhrmann’s Romeo & Juliet with a live choir). The cinema aims to offer its audience an immersive movie experience, with many screenings featuring actors, exciting physical sets and live music. Having made our way to Mercato Metropolitano in London, we found an intriguing Narnia-esque door, guarded by a very lovely elf. We arrived 90 minutes before the film was due to start (doors typically open two hours before the film begins) as seats are allocated by section and I wanted to make the most out of this Christmas cinema experience. The welcoming elf then opened the wardrobe door and ushered us in. We made our way through the hanging coats and found ourselves on a narrow pathway lined with fir trees and fairy lights. The short path led to Backyard Cinema's screening room. It is a stunning space - all white washed brick walls, festive foliage and even more fairy lights (you can’t have too many in my book). Taking our seats, we sank into extremely squishy and yet remarkably supportive bean bags. These things are so cosy and comfortable - once I was settled, I didn’t want to move. Each seat comes with a cosy blanket and on this chilly afternoon, we were glad of them (we kept our coats on too!). It was at this point that I realised we had 50 minutes to go before the start of Elf. However, Backyard Cinema is such a lovely place to be - the time just flew by. In addition, once you have bagged your seats, you can come and go as you please. 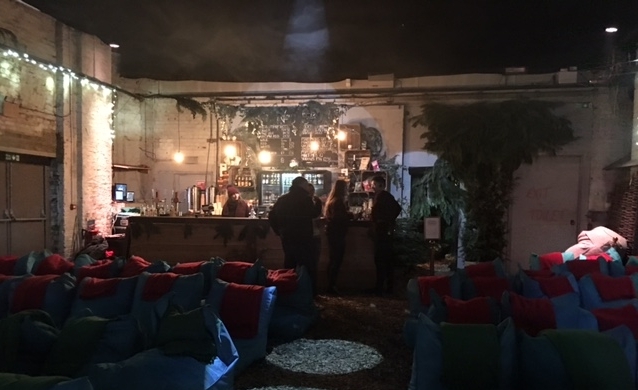 Backyard Cinema has a bar selling beer, wine, cocktails and soft drinks and a small variety of snacks (sweets, popcorn and, on this occasion, mince pies). No hot drinks are sold but we were allowed to bring coffee and hot chocolate in from the market outside. Refreshingly, no hot food is allowed inside the cinema to limit distracting smells. About ten minutes before Elf was due to start, the room darkened and (alongside a small smattering of ads) we were treated to some festive music classics (think Frank and Bing) and a Pixar short. Then Elf began. It was wonderful to watch Buddy on a big screen with a respectful and appreciative audience. The film was well projected and the sound was (to my admittedly untrained ear) perfect - coming from powerful, well positioned speakers. If you are in London, I would thoroughly recommend Backyard Cinema. I'm looking forward to stepping through that wardrobe again. Do you love Elf? What is your favourite Christmas movie? 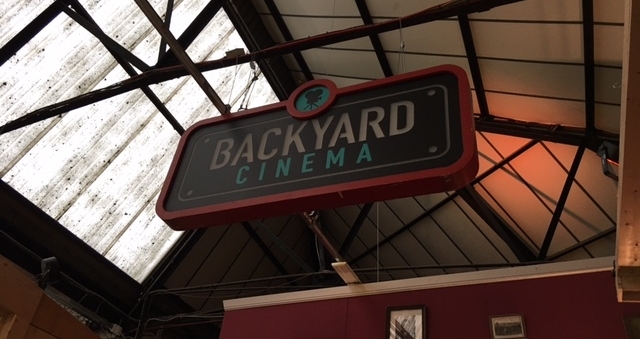 Have you been to an event at Backyard Cinema? Alternatively, have you ever watched a classic movie in a cinema like Backyard Cinema? Tell me your movie stories in the box below!